Engage and manage your staff from anywhere with SMS communications. The next generation of internal communications. An employee communication tool that works for your business. Automate your messages for an efficient staff management solution. Automate messages with API integration. Enable SMS sending from your existing staff management software by integrating with the Esendex API. By integrating with our SMS API, you can improve the efficiency of your business, creating a seamless experience for your employees. Custom sender IDs, short codes and long numbers. Customise your sender ID to specific departments so that your staff members know who is contacting them. 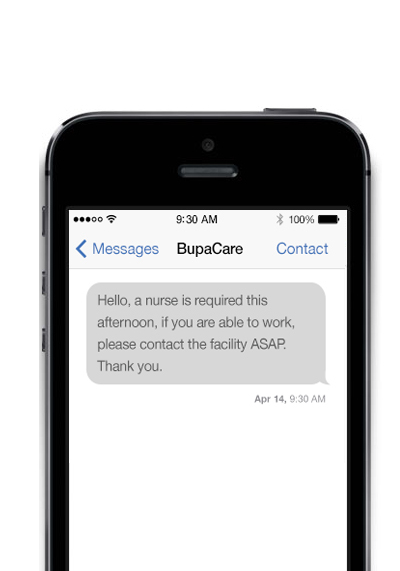 Enable two-way conversations by using a short code or virtual mobile number and receive messages from your staff and recipients. Enable mission critical messages to be delivered and responded to within real-time thanks to the super fast delivery times and the better response rates associated with SMS, making it easdier to contact staff when they're in the field. Combine with Esendex Voice Broadcasting to create a more intelligent solution to ensure your member of staff gets the message while on-the-go. Streamline your business processes by scheduling messages ahead of time and improve efficiency in the workplace. Scheduling text messages will take some weight of your shoulders and ensure that no matter what else happens that day, your messages will still be sent as planned. Receive Push Notifications directly into your integrated app or software which tell you whether your messages have either arrived at its destination, failed to arrive or when you have received a message from somebody else. "The immediacy and the extensive reach of SMS has dramatically improved our operational efficiency." SMS and mobile messaging are an instant way to connect with people and not only for marketing and reaching customers on-the-go but also reaching your staff in the field or across departments. Emails can sit in inboxes unread for hours, if they are read at all whereas text messages have a 98% open rate ensuring that your message is likely to have been seen. Incorporating mobile into your communications strategy is a primary way of staying connected with everyone that matters to your business. Mobile technologies are an integral part of how businesses communicate and should be incorporated as part of any businesses internal communication strategy. "86% of employees say SMS shouldn't just be reserved for customer communications"
Employees who are more connected to their company are 20-25% more productive. Almost 70% of employees think their organisation should be using SMS to communicate with them.